New developments in the O&M sphere, combined with the revised FIT program will likely make mountainous racking and other technologies viable development and operational alternatives. The Japanese feed-in tariff program started 2012 and caused a massive surge in solar PV deployment. This trend peaked in 2015, when over 10.8GW of solar PV capacity was installed. In May 2016, however, the Japanese Diet passed a revision to the Renewable Energy Law. The aim of this revision is to tackle the growing backlog of unfinished solar PV projects that have emerged as a result of the previous feed-in tariff’s lack of commission deadlines. Because there are no fixed timeframes for plant operations, solar PV operators have the incentive to wait as long as possible after securing approval to take advantage of cheaper and more efficient technology. Plant operators eagerly rushed to secure the high tariffs offered during the program’s first years, leaving their projects in an indefinite limbo. This lopsided regulation has become so problematic that as of September 2016, of the 80+ GW of solar PV projects that have been approved, only 30 GW have actually been commissioned. Under the new system, solar PV projects will need to have their business plan approved. A key part of this approval process will be to meet appropriate deadlines. Comparatively, under the previous FIT system approval was much easier to secure, as it mostly involved a feasibility overview of the proposed facility. The revision also includes a tender scheme, which aims to cut prices and to encourage investment in other renewable sources. From 1 April, a nationwide pay-as-bid tender will be implemented for all projects greater than 2 MW with a ceiling price of 21 Yen/kWh. The first and only tender round of 2017 will be held in October. From 2018 on tender rounds will be held on a semiannual basis. Based on the details of the revision, RTS Corp estimates that annual installed capacity will continue to trend downwards, reaching a low of 4.5 GW in fiscal year 2023 and remaining stable throughout the decade. Currently, the FIT program has been in a blackout period since 20 January 2017, not accepting any new applications until the new regulations take force on 1 April. 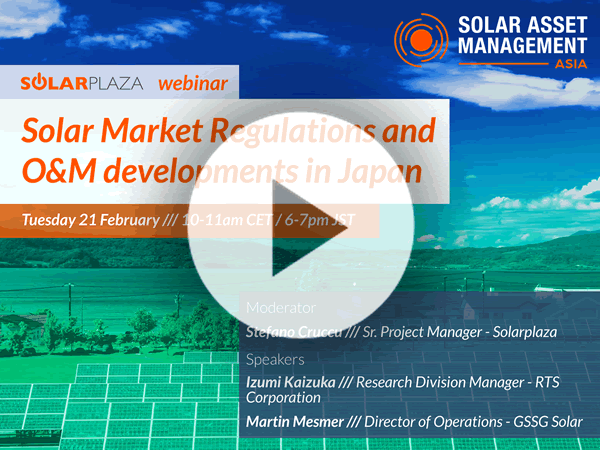 The implications of the new revision are numerous, and Martin has his own predictions as to what the solar PV landscape in Japan will look like. Since Japan is a volcanic island, flat land is scarce. Grading mountains is a very expensive task, and with feed-in tariffs dropping, it is likely that mountainous development will soon become a viable and desired alternative. One of the most promising and least utilized alternative development methods in Japan is racking, which has gone largely unnoticed in favor of solar sharing and floating modules. However, in 2017 the Japanese Industrial Standard (JIS) 8955, which governs the design of photovoltaic structures, is about to change, enforcing fairer regulations on the design of ‘outfield’ modules (which are exposed to threats of earthquakes, snow and wind). The utilization of drones makes the prospect of racking even more enticing. Labor costs in mountainous terrain are enormous, especially in some areas where up to two meters of snow can accumulate. Drones are a great contributor to the design and development phase, during which they can gather vital terrain data that would otherwise be hard to obtain. They can also reduce operations and management costs, since their combination of aerial mobility and automatic monitoring can drastically cut down on plant overhead. Another development Martin expects in the near future is portfolio aggregation. Since the revised FIT program enforces a tender process and stricter requirements for plants larger than 2 MW, it is likely that companies will start building smaller projects that they will then aggregate. Learn more about regulations and other in-depth topics related to solar operations and maintenance and solar asset management at the 3rd edition of Solar Asset Management Asia (8-9 June 2017, Tokyo), the region’s leading event focused on the operational phase of solar plants and portfolios.